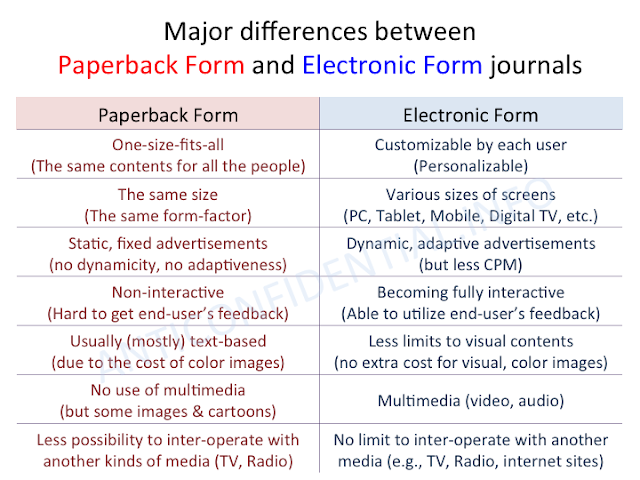 In this post, I would like to handle one issue related to the existing, or, radically changed media's - especially on journals' - business model. Then, I will provide some of my random thoughts on how to face the current and future problems coming into the legacy media journals' businesses. Most of you will be familiar with the legacy daily journals. Their previous (up to the year 1990's) business model was so concrete, and there were two different revenue streams; one is from the subscribed readers, and another is from the advertisement on their journals. Also, the daily journals are read by the end-users at most two times, so the magazines or journals' consumption time was almost predictable. Based on that, the media companies could take different targeting to users on morning and evening times. Finally, there were one-size-fits-all format and contents, so the readers usually skim and skip non-relevant topics and see the most relevant articles and/or news for them. However, things have changed since the evolution of digital news and magazine, journal services. People now can see any news from the web, with different sizes of screens, at anytime. In addition, recent disruptive magazine services (e.g., Flipboard, Pulse) are forming the news articles with more visual interfaces, and their users act more interactively when they read the electronic-version articles, by clicking some words to see more details and more previous news articles. Also there are few more interesting features but not fully utilized at this moment such as multimedia contents, and the inter-operabilities among multiple different media channels (TV, radio, internet sites). Figure 1 summarizes the major differences between the previous, paperback form journals and the current, electronic journals. My answer is quite complicated, but I strongly believe that we still have many chances to change our world with 'a combination of our new business model, and some of internal strategies, and approaches' to the improvement. First of all, I would like to start with SWOT analysis, and will provide answers for each S-O, W-O, S-T, and W-T scenarios (see Fig. 2). 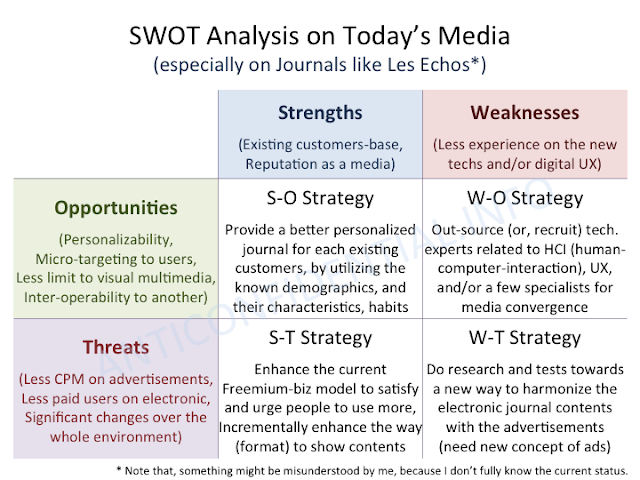 Note that, I conducted this SWOT analysis based on the perspective from Journals like Les Echos, NY Times, etc. The following are the S/W/O/T, respectively. So, we can take four different strategies based on our current situation, and it will definitely take certain amount of time to change the existing infrastructures and our business model to fit into the new strategies and approaches. However, it's worth to try them before losing the current users and market share to the new social media and magazine services. That's all at this moment! Note that this is just based on my personal perspective, so please feel free to contact me if you're interested in discussing more.